An effective Programme or Project Management Office (PMO) is invaluable: it ensures your investment in delivery and change projects are translated into the best possible results. CPC Project Services is a leading provider of PMO services, having delivered project management excellence for organisations for over 25 years. We will help you to create the right solutions, structure and tools that you need to achieve a sustainable PMO service. 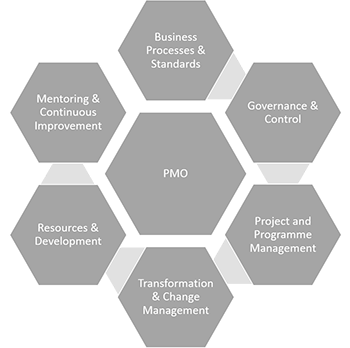 Our PMO solutions can assist you by setting up a new PMO; assessing performance through project, programme and organisational review; advising on project & programme management (PPM); project controls and reporting; and portfolio, programme & project offices (P3O). We can also develop methodologies, tools, and processes to transform your existing PMO; leading and managing your organisational change, providing skilled professionals to complement your team, business case development and developing your staff capability and resources to meet your PMO needs. Following an ORR review in November 2016, the Rail Safety & Standards Board (RSSB) committed to fundamental changes to its organisation. CPC was commissioned to develop and implement business improvement initiatives including establishing a single Projects Directorate and PMO across RSSB. Whatever form they take, our PMO services are founded on clear objectives and metrics combined with strong governance. This ensures they add value and provide meaningful support to your senior executives and project teams.